Interior Secretary Ryan Zinke took a private chartered flight costing taxpayers $12,375 from Las Vegas to Montana after speaking to a political donor's professional hockey team in Nevada, E&E News has learned. Zinke caught the flight on June 26 after talking to players for the Vegas Golden Knights, the new National Hockey League franchise. The team is owned by Bill Foley, a billionaire businessman and board chairman of Fidelity National Financial Inc. Foley twice gave $2,600, the maximum contribution, to Zinke's political campaigns when the Republican successfully ran for Montana's congressional seat, according to forms filed with the Federal Election Commission. Altogether, the company has donated $179,123 to Zinke since 2013 through its employees, its political action committee and Fidelity National Information Services Inc., a related entity, according to OpenSecrets. Fidelity also owns Chicago Title Insurance Co., which has contributed $23,900 to Zinke's campaigns. Zinke and Foley both have homes in Whitefish, Mont. Foley also lobbied for Zinke's nomination for Interior secretary (Greenwire, Jan. 23). The Interior Department defended the travel, saying no commercial flights were available to shuttle Zinke between Las Vegas and Whitefish, where he was scheduled to attend a meeting of the Western Governors' Association the following day. A spokeswoman said the department's ethics office approved the travel, noting Interior's Office of Aviation Services had a contract with Choice Aviation LLC to call on the plane when needed. 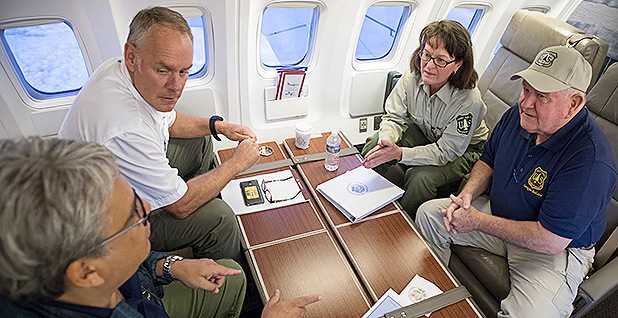 The discovery of Zinke's chartered flight, found by E&E News in government contract data, comes as Trump administration officials face scrutiny for using private planes. Health and Human Services Secretary Tom Price announced yesterday that he'll refund taxpayers the more than $400,000 he spent on private chartered flights since May. U.S. EPA Administrator Scott Pruitt has billed the public $58,000 for private and military flights (E&E Daily, Sept. 28). Interior's relationship with Choice Aviation, which is owned by Jay Nielson — the grandson of an oil magnate — predates Zinke. The company's equipment has been available to other Interior officials since September 2014, when the firm was awarded a contract worth $21,819 under former Secretary Sally Jewell. That contract ended Jan. 4, 2017, according to government records. Choice Aviation generally assists with wildfire suppression and surveying wildlife in remote areas. Before boarding the plane, Zinke addressed the hockey players over a closed-door dinner event. That raises questions about whether he was conducting official government business, said Kathleen Clark, an ethics expert at Washington University in St. Louis. "It's not clear to me that the Las Vegas meeting was official," she said in an interview. "It was on his calendar, but it might have been the equivalent of a dentist visit. It would be hard to differentiate it from 'I'm doing a favor for my friend.'" Interior's ethics department cleared the speech beforehand, according to spokeswoman Heather Swift. "As a former military officer and current government leader, the Secretary was asked to give a speech about leadership and the importance of teamwork," Swift said in an email. "The Department's career ethics officials determined this was well within the Department's mission and it also was a key audience of people we are trying to target to use our public lands." In a joint statement, Interior's designated agency ethics official, Melinda Loftin, and the department's deputy solicitor for general law, Edward Keable, said, "The trip was reviewed and approved in advance by both the Departmental Ethics Office and the Division of General Law. In short, the trip — including the Secretary's address to the hockey developmental squad — was completely compliant with all applicable laws, rules, and regulations." The timing of the dinner event prevented Zinke from flying commercially between Las Vegas and Kalispell, Mont., according to a document from the Interior solicitor's office requesting approval for Zinke's use of a private chartered flight. "In Las Vegas, the Secretary's official events do not end until 7:30pm, after the final commercial flight to Kalispell," the document says. Earlier in the day on June 26, Zinke was at an event in Pahrump, Nev., to announce the distribution of funds to rural communities that get payments for having nontaxable federal land within their borders. That event concluded at 3:40 p.m. PDT, according to his public schedule. Zinke boarded a flight to Las Vegas and arrived at the Red Rock Hotel and Resort to address the Golden Knights at 4:45 p.m. PDT. He then departed for the Henderson Executive Airport in Henderson, Nev., at 7:45 p.m., arriving at 8:30 p.m. for his private flight to Kalispell. Leland Blatter was the pilot. "I make a habit of not talking to reporters," Blatter said when reached by phone. Two commercial flights bound for Salt Lake City departed Las Vegas as Zinke was attending the hockey dinner. Travelers on those Delta Air Lines flights, leaving at 5:50 p.m. and 6:50 p.m., could have caught a connecting SkyWest Airlines flight that landed in Kalispell at 11:56 p.m., according to FlightStats. Zinke's private chartered plane touched down in Kalispell at 1:30 a.m. MDT. Swift dismissed a question about whether Zinke's attendance at the hockey dinner affected his ability to take a cheaper flight. "Suggesting that by cancelling meetings and events the Secretary could make a different flight is not a valid argument," she said. "That point could be made for every person who ever books flights. It's important for the Secretary to be in the field talking with the American people and meeting with local and state officials, which was exactly what he was doing on both legs of that trip." Government officials must select the "most advantageous method of fulfilling the Government's need, price and other factors," according to federal contracting guidelines. That means chartered flights may be permissible if commercial flights cannot be reasonably accommodated. Zinke also took chartered and military flights while in the Arctic and to survey remote national monuments when other air travel wasn't available. Interior also chartered flights for $3,150 between St. Croix and St. Thomas of the U.S. Virgin Islands, according to government records. The flexibility to take private flights exists if the official is performing government business. Zinke's detractors argue that isn't the case with his speech to an NHL team owned by a donor friend. "Zinke gave a few inspirational remarks to hockey players and used that as an excuse to bill taxpayers for a private plane when he could have easily made a commercial flight out," said Aaron Weiss, media director with the Center for Western Priorities. Reporters Benjamin Hulac and Evan Lehmann contributed.